Connie Can Crop here with another fun card for you today! Action Wobbles really put the hippity hop in my fun froggy card! Making a rocker card with a wobble is so much fun! The card rocks and the frog wobbles! 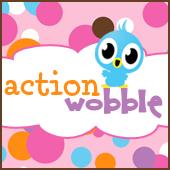 Be sure to check out Action Wobbles on the BLOG and on Facebook. Join us for the Wobble Wednesday Challenge! And be sure to come join our NEW Facebook Fan Club! Super adorable card Connie just love all the wobble action.